The Seiko SKX has definitely become a cult classic for watch enthusiasts around the world; with the Black SKX007 and ‘Pepsi’ SKX009 references becoming the most popular variants. It almost seems you can’t be considered a true watch ‘aficionado’ without having tried out at least one of the them. 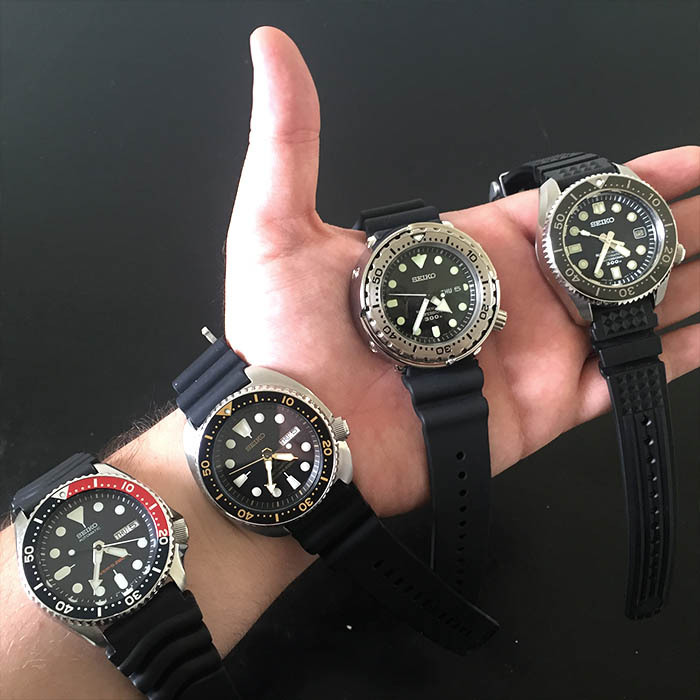 Which Seiko Diver To Buy? Fortunately I’ve owned both over the years, and would like to share my thoughts as an owner, and as a watch fan. Like many in this hobby; I’ve flipped, trimmed, and expanded my collection several times. The only constant besides change in my watch rotation has been the SKX009. It’s become my trusty go-to companion. I’ve owned some pretty cool watches of various price points over my years as a watch fan and collector. But I don’t think I’ve ever formed a stronger bond with a watch than the one I have with this little beater. Let me tell you why I like it so much. One, the value for money. There is something immensely satisfying about the level of watch you receive for the amount of money you put down. I bought my example for $165 brand new, as well as spending another $55 for a good quality after-market bracelet. For that price it’s nearly highway robbery -and I am the law breaker! Lastly, the more you beat up on it- the better it looks. This seems to be counter-intuitive on the surface, but hear me out. I, like many other SKX owners, bought this watch to be my ‘beater.’ watch. One to throw on wrist when you don’t want to bang up a more expensive piece. One to get dirty, one to take on adventures. One that gives you peace of mind, in what could be challenging situations for a more delicate or beautiful model. And perhaps most importantly, one that won’t break your heart or your wallet should it get scratched up, or need a repair or replacement. I’ve only had mine a few years, but I’m proud to say I’ve put some good little scratches, dings, and dents in it. I’ve worn it in many situations over the years, from doing demolition work, to rafting trips, and even the occasional game of pick up football. My two year old has even tossed it down the staircase in my townhouse! Through it all, it doesn’t skip a beat. I can’t seem to affect this watch, no matter what it goes though. So when I glance down at my wrist and notice the scratches, the marks, and the scuffs; it gives me a sense of pride. It reminds me of the experiences and activities I’ve shared with it. And since it has gone through everything with undeviating performance, it instills a confidence that it will just keep on performing in an admirable and constant way. And that is a beautiful thing. Yes, the more a beater is marked up; the better looking it is in my eyes, and I gain a higher level of respect for that watches’ wearer. They know how to use a tool watch properly, and aren’t afraid to do so. The SKX009 handles these duties of a beater so very well. I really feel it’s one of the best you can buy in today’s market. There is no such thing as the perfect watch. But this one doesn’t have too many though. I’ll admit that it is kind of ugly. It has that quirkiness Seiko’s international offerings often have. But what you first see as unattractive; strangely becomes beautiful. That is one of the things about Seiko. You can hate it one instant and a month later be shopping online, hungry to spend your hard-earned money on a model you initially wrote off. I think this applies to the SKX series, and you wouldn’t be the first to think it is ugly, then change your mind and appreciate the beauty. Now there are other potential negatives as well. It’s in-house automatic movement does not hack or hand-wind. This is something that irks some, but doesn’t bother me, given its price point. For an automatic movement, with a day/date complication it does really well. If you don’t intend on wearing it daily, pick it up and give it a few good shakes in the morning. Pretend you’re about to throw a Frisbee and flick your wrist a few times with the watch in hand. Feel the bi-directional rotor spin and wobble. A little movement everyday keeps it going just fine. I recently put mine on a time-grapher and it was averaging a +1 sec per day deviation. That is better than my other daily wear – an ETA based Tudor Black Bay. It also can be argued that the factory strap options are a bit of a letdown. I definitely cede that. Its one of the reasons I opted to add this sweet Strapcode Super jubilee bracelet. But bear in mind even if you do spend a little extra money upgrading the strap options, I think you’re still getting a solid amount of horological value. My SKX009 came on the black rubber strap. It’s a compression dive style with plenty of length. It reminds you that you’ve bought a professional diver and could use it on a wet-suit without trouble should you desire. If you’re hesitant to spend extra money on aftermarket rubber, mesh, or bracelet, then you can get an affordable Nato. It’s kind of fun to add a color and change the look and feel of the model. One of the ways to add versatility without adding much to the cost. After all, the lower price is a satisfying element to ownership. Some watch fans have opted to buy the newer SRP ‘Turtle’ release over the venerable SKX. The new Turtles share the similar heritage design language. They come with a larger cushion case, and a newer movement that hacks and hand-winds. I definitely understand the draw. I jumped on the 775 when it first came out, thinking it would eventually replace the SKX as my affordable go to diver. I definitely think it’s another solid offering. But guess what? The turtle is no longer in my collection, and I happen to be wearing the 009 as I type. Which SKX Should You Buy: SKX007 or SKX009? Should you, like me, decide you need an SKX, which version should you go for? There are American market only 17x references. There are K and J versions of the 007/009. There are out of production colorized dial versions. What do you do? What do I recommend? From an owner and fan’s perspective, get a 007k or 009k version. Don’t buy into the made in Japan ‘J’ hype. My made in Malaysia ‘K’ version looks better in my eyes, and is less expensive. Don’t be afraid of buying old stock. My example was produced in 2007 and has never been serviced. It is running perfectly, and I have no regrets. Remember, a big part of the draw is the affordability, so buy cheap, don’t be afraid to buy used, look for low prices from reputable sellers. This will likely become your go to beater after all. So I would pass on the more expensive or discontinued versions. To sum up: The SKX is a great example of a well designed affordable diver made to be used, and used hard. There is no wonder why Seiko has produced it unchanged for the past 20 years. It’s not broken- so don’t fix it. There is a tangible draw to the model that is hard to dismiss. Talk to other SKX lovers and you’ll hear similar things. The size, the price and the performance really bring a lot to the table. Having only spent what I did on the watch- there is no logical reason to ever move on from it. Especially when I consider the satisfaction and performance it renders. Seeing as this watch seems to defy traditional logical reasoning- it will forever stay in my ever-changing collection. Last but not least: rumor is Seiko has halted production on the line, with the aforementioned ‘prospex turtle’ being the market’s intended replacement. So if you’re considering picking one up, I wouldn’t wait much longer. Reviewed by Paul Anthony, on January 16, 2018 . "The Seiko SKX009 is a reliable timepiece at an affordable price. The SKX009 and SKX007 both offer great value for money." Thank you for your comment. This is above my pay grade for the SKX line. Regarding the case bevel and sharpness of the lines, it’s not really a K vs J thing. I’ve seen K as well as J pieces with sharp lines, finishing, and bevel, and I’ve also seen K and J pieces with more rounded edges and more of a blended finish. It’s more piece by piece, rather than where they are manufactured. Good article ! I own a SKX009 and a Rolex Datejust. I paid $1300 brand new for the Rolex in 1980 and $189 for the Seiko. The Seiko time keeping is almost as good as the Rolex and the Seiko crystal is better…..along with waterproofing. You can really hear the rotor on the Rolex flopping about but not the Seiko. Years ago I accidentally over wound the Rolex. It cost $500 in 1980 to repair ! Thanks for the feedback on your own watch collection and experience! Helluva of a good honest review. i have own a skx 007 with moded 4r36 movement and sapphire glass and ceramic bezel and let me tell you I’m in love!!! i i own a rolex submariner 116619 which is my holly grail watch, along with other Swiss brand . The SKX always puts a smile on my face at the office or out and about the versatility is unparalleled to any other watch that i have own and that’s why i love this watch so much. Glad you liked the review, and that sounds like quite a collection you’ve got! The SKX puts a smile on our faces too! Thanks so much. This article was a major factor in getting my 009. One quick question – where did you get the green Nato with dinosaurs? I enjoyed the review as well. I also have several high end Swiss watches and various movements (we all must have some sort of Valjoux 7750 chrono of course)! About to take a trip to Maui and you guessed it – my venerable SKX007 (with ceramic bezel and ratcheting clasp endmill strapcode bracelet) will be my snorkel and dive watch. I don’t really know why I like this thing so much either (perhaps because MY upgrades make it unique to me?) Mine has also kept great time (about +6/day) with a perfectly aligned chapter ring (I have a K version of course). To others that may have surfed on in to yet another SKX review – get one. If you have gotten this far, you won’t regret it! 1,000% agree, it’s such an amazing piece to have in any collection at practically a no-brainer price point. This watch is not a showpiece to be displayed, faultless, in a case on the mantle. It is a beater and as such little does it matter if the case bevel line is not razor sharp. It will gather it’s wounds over time and it will not matter at all, quite the opposite. This from the owner of several hi grade watches incl. a well used Rolex 1675 GMT since 1975. With values as they are today I had no option but to park the Roller (my ex beater) and wear the SKX and Turtle, without a care in the world. You have to take these review in context to the relative price points. The SKX watches and most Seiko’s offer insane value, and as you so rightly say is a “beater” without a care in the world while still being a great watch!